Between creating this blog and going to PAX Aus, October was a big month for games at our house. Although we mainly blog about pub-weight games, we also play bigger games and RPGs. So, we’ve included those here for posterity, too. We picked up 15 new games for our collection during October. The seven we also played this month are in bold. Reviews are linked as we complete them. New additions to the stash. So, we played almost half of our new games. Not bad considering we picked up several of those during the last week. We won’t play Pandemic Legacy Season 2 until we get our Legacy team together again, too, of course. Teaching a friend to play Hive. We picked up some fantastic two-player games, including Hive and Onitama. 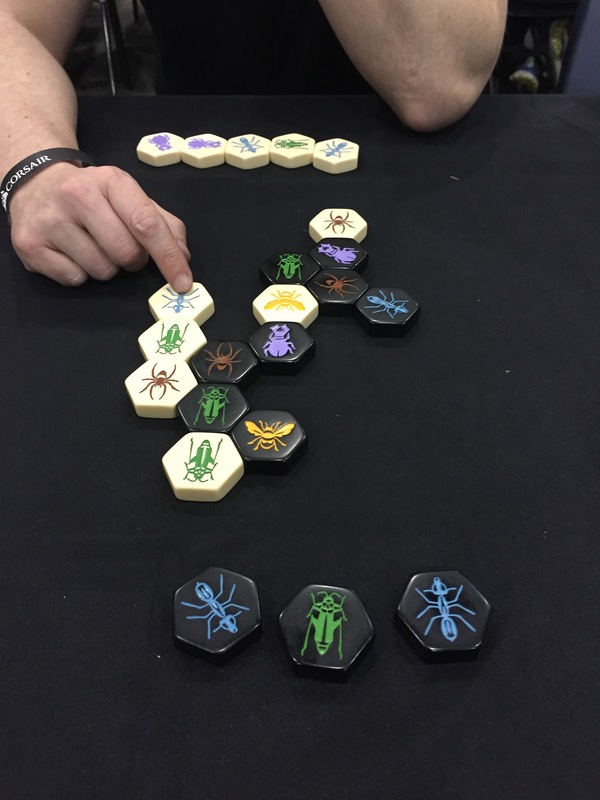 I’m especially in love with Hive and try to get people to play it with me as often as possible. I also loved both Unspeakable Words and Paperback. Both are light word games with a bit of strategy, but nothing so heavy you can’t enjoy your beers and chat during the games. At PAX, we tried Kingdomino with groups of three and four and thought it was a great game. When we got it home, we played it with two and were even more impressed. For a single mechanic game, Kingdomino is very satisfying to play. We’re eager to play Queendomino next. I’d wager there’s an excellent chance it appears on our new games list for November. *These have long since been amalgamated in our collection. That makes a grand total of 25 different games played in October. In addition to PAX, we hit up eight other venues this month for games and drinks, mostly pubs around Melbourne. Bar Josephine in Footscray is one of our mainstays since it’s game-friendly and they always have excellent beers on tap. We’ll do a full write-up of it soon, but I thought it at least needed a mention for this first round-up since we’re there so often. One of our new discoveries this month was The Creators Lounge, also in Footscray. We went there because they were rumored to have Jedi Juice, one of our current favorite beers, on tap. They usually feature excellent beers, just $8 a pint during happy hour. We’ve not explored their menu deeply yet, but their sandwiches are delicious. Dying glorious deaths at the Dreary Hamlet. Another that I enjoyed was Dreary Hamlet, which we picked up somewhat randomly from the table featuring games by Australian designers. I loved the artwork and the coins were ridiculously pretty. 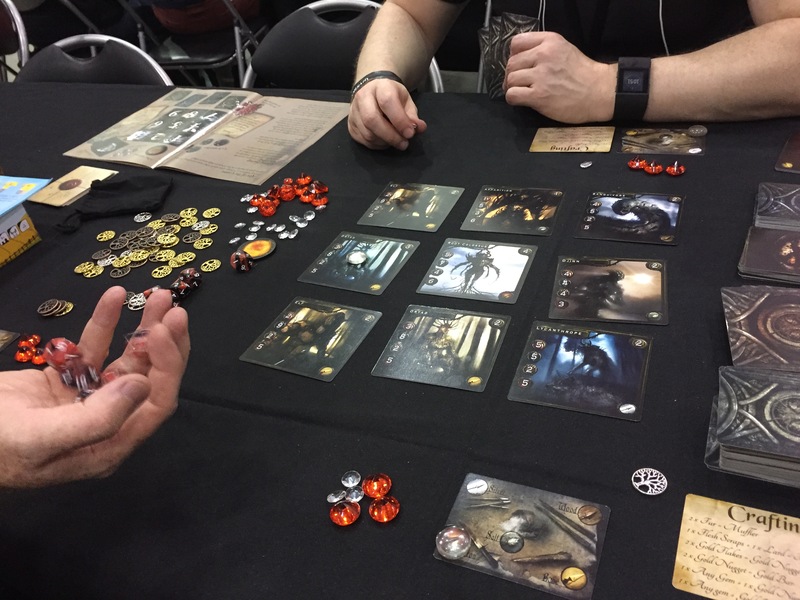 We played with both two and three players during PAX and ultimately, I’d probably buy a copy if I could track one down. My fingers are crossed for a second printing someday. 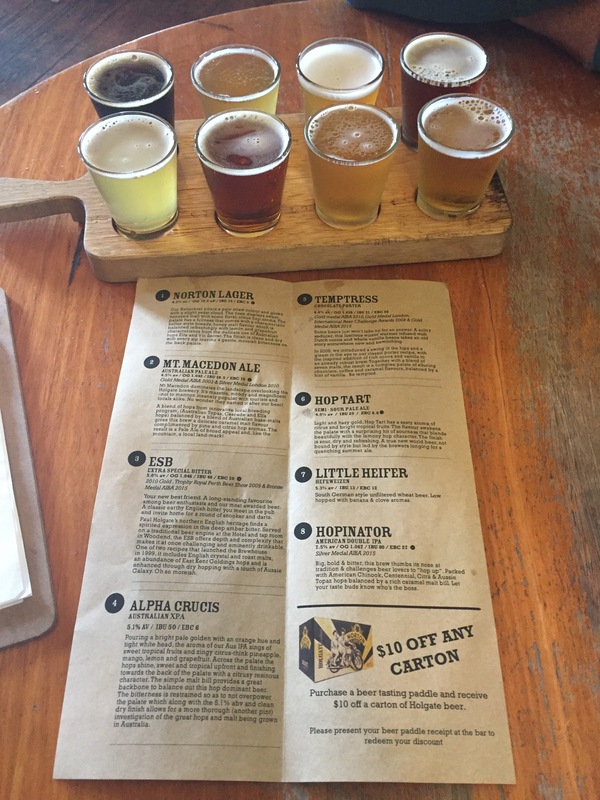 The tasting paddle at the Holgate Brewhouse in Woodend. My favorite session, however, was our trip up to Woodend to see friends, drink beers, and play games at the Holgate Brewhouse. Over the course of the afternoon, we played Hive, Onitama, and Gloom over many tasty beers.